Five (5) additional Armory tabs have been added for all characters, bringing the total to 10. Legendary Potions are no longer stored in player inventory and can be accessed or changed by right-clicking on the potion icon in the action bar. Greater Rift Keystones are now stored in the Materials tab (Any existing Greater Rift Keystones in both inventory and stash have been automatically moved). Primal Legendaries are now marked by a red beam when they drop. Primal Legendaries on the ground are now indicated by a red pentagram icon on the mini-map. Primal Legendaries now have a red border and updated background on their icons. Paragon points can no longer be swapped while a Greater Rift is open. 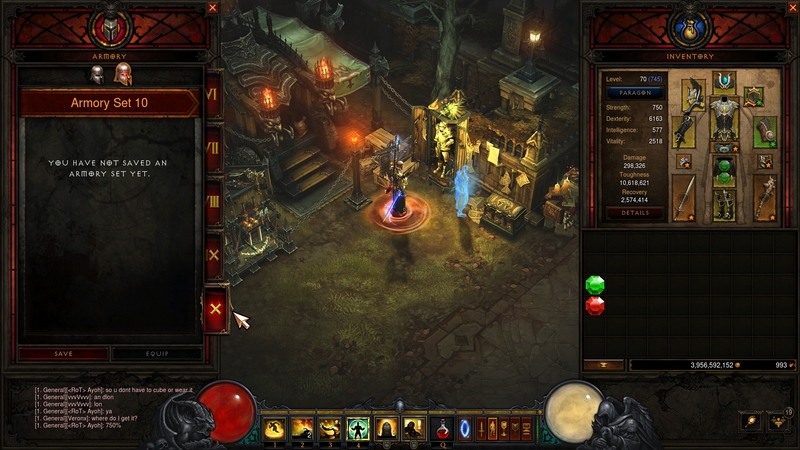 Players can now be matched into public games where a Greater Rift is open. Players who join in this manner will not be able to enter the active Rift, and players inside the Rift will be able to continue with no additional difficulty scaling until the run has been completed. The buff for Season of Grandeur has been implemented. This buff does not stack with additional Ring of Royal Grandeur (either equipped or in Kanai's Cube). Unlike previous Seasonal buffs, this buff will not apply to Non-Seasonal players. When completing a Greater Rift level 70 solo for the first time in a Season, a Primal Legendary is guaranteed to drop from the Rift Guardian.